Gallia Academy’s John Stout (6) gets a block from teammate Garrett Burns (3) during the Blue Devils’ Ohio Valley Conference football game against Chesapeake on Friday night in Gallipolis, Ohio. GALLIPOLIS, Ohio — For the Blue Devils, it seemed like everybody got an opportunity to ring the victory bell at historic Memorial Field on Friday night. And when the daughter of first-year Gallia Academy head football coach Alex Penrod got the final ring, you knew for sure that the Blue Devils had enjoyed the evening. 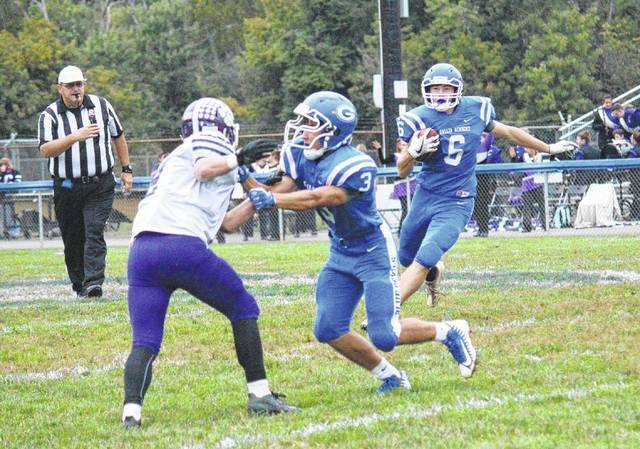 In perhaps the program’s most meaningful win in the past five seasons, the Blue Devils defeated the visiting Chesapeake Panthers 34-21 in the Ohio Valley Conference opener for both clubs. Just how important was Friday night’s OVC victory for Gallia Academy? In addition to leveling their record to 2-2, the Blue Devils equaled their win total from the past two seasons combined. But the Panthers, perceived as one of the favorites to capture the OVC championship besides Ironton and Portsmouth, entered the affair undefeated — and ranked seventh in Division VI in the first release of the Associated Press statewide poll. But Gallia Academy actually dominated Chesapeake, despite most observers and experts predicting perhaps a Panther blowout. After all, according to the OVC preseason media poll, the Blue Devils were picked to place seventh in the eight-team league, while that same poll predicted Chesapeake to finish as the runner-up. Instead, Gallia Academy snapped Chesapeake’s eight-game regular-season win streak, as the Panthers posted a 9-1 record a season ago. Penrod said the Blue Devils’ preparation for the Panthers was of championship caliber. While preparation was one thing, gameplanning and execution are two others. The Blue Devils did both, despite being outgained by the Panthers 313-291, including 271-254 in rushing yardage. While Chesapeake junior standout quarterback Austin Browning amassed 213 yards on 20 carries, including a 64-yard scoring scamper to make it 34-21 with only five minutes and 21 seconds to play, the remaining Panthers only accounted for 100 total yards. The Panthers punted twice and turned the ball over on downs once, as Browning threw a pair of critical interceptions, including with only a minute-and-a-half remaining to end any comeback bid. Browning was just 2-of-7 for 42 yards with the two picks, including the clincher by the Blue Devils’ Tanner Allen at the 20-yard-line. “We knew coming in that (Austin) Browning was a very special player and we wanted to gameplan around him. Not that their other kids weren’t athletic and couldn’t make plays, but we really wanted to let their other guys try and beat us tonight,” said Penrod. They didn’t, and the Blue Devils made plays in the return game that resulted in good first-half field position — and subsequently a 22-7 halftime advantage and a three-touchdown edge (28-7) following three quarters. Jacob Campbell returned the opening kickoff 37 yards to the Panther 37, as the Blue Devils —between Campbell and quarterback Justin McClelland for all but one carry —crafted a nine-play three-minute drive that ended with McClelland carrying for the final 11 yards and a 6-0 GAHS lead. Exactly 12 minutes and 54 seconds later, at the eight-minute mark on the dot, Garrett Burns intercepted Browning at the Blue Devil 25 — and returned the pigskin 58 yards up the sideline to the Panther 17. Campbell covered all three runs of the 53-second scoring drive, as his seven-yard touchdown — with McClelland converting the two-point extra-point run — made it 14-0 GAHS with seven minutes and seven seconds remaining in the opening half. “The big key of the night was field position. We started in positive field position and we put them into some predicaments and uncomfortable situations of down and distance. That dictated where the football game was at, and we were able to control a lot of things,” said Penrod. Such as the offensive and defensive fronts. The Blue Devils rushed 45 times, with Campbell carrying 21 times for 123 yards — and McClelland adding 18 totes for 115. Both scored twice on the ground, as Campbell’s 1-yard plunge made it 28-7 with six minutes left in the third, before McClelland dashed 38 yards exactly 12 minutes and 26 seconds later to make it 34-14. While the Blue Devils’ final three scoring drives consisted of nine plays and 63 yards, seven plays and 69 yards and finally eight plays and 67 yards, Chesapeake started only one drive outside of its own 37. Trailing 34-21 with less than three minutes remaining, the Panthers began their final possession at their own 5-yard line — after a Boo Pullins punt pinned them there. Chesapeake did slice the deficit in half to 14-7, marching 10 plays and 65 yards, as Kamren Harless had a seven-yard TD run at the 2:41 mark of the second quarter. But the Blue Devils immediately answered in only two-and-a-half minutes, as John Stout returned the kickoff 27 yards to the GAHS 37 — followed by back-to-back gains of 35 by McClelland and 12 by Pullins. On 3rd-and-goal from the 4, McClelland completed a quick slant to Cory Call with 10 seconds left in the half. Campbell then ran in the extra two points, making it 22-7, as Chesapeake got no closer than 28-14 with 11 minutes remaining. The Blue Devils return home, and return to OVC action, next Friday night against Portsmouth. And, perhaps everybody in Blue and White will have another opportunity to ring the victory bell.